The inorganic coordination chemistry of peroxovanadium compounds relevant to insulin mimesis is reviewed. 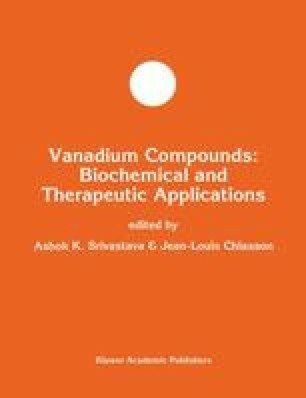 The structure and kinetic reactivity of solutions of vanadate anion, vanadyl complexes and peroxovanadate complexes are briefly compared. Peroxovanadium compounds contain an oxo group, one or two peroxo ligands (O 2 2− ) and an ancillary ligand which is usually bidentate. These compounds approximate a trigonal bipyramidal structure which can be divided conceptually into a polar ‘oxo’ half and a relatively non-polar organic half. This presents a number of interesting design variations which are discussed with respect to the development of a rudimentary structure-activity correlation of insulin mimetic ability.